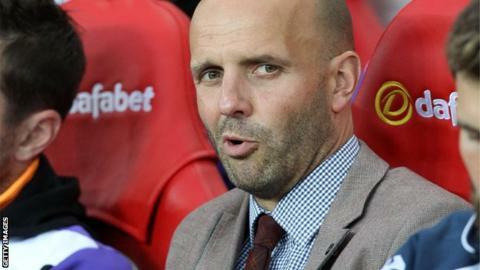 Exeter City manager Paul Tisdale has praised the patience shown by his side in the 1-0 win over Hartlepool. Christian Ribeiro scored in the second minute of stoppage time as the Grecians won their third successive game and moved up to sixth place in League Two. "It was a game where we kept total patience and discipline in the way we played," Tisdale told BBC Radio Devon. "We certainly didn't panic and change our game, and we gradually built our pressure and we got it in the end." The victory came a week after City demolished previously unbeaten League Two leaders Leyton Orient 4-0. "I thought we played really well, in a very different way to last week's win," added Tisdale, whose side have not conceded a goal since the 2-1 loss at AFC Wimbledon at the end of last month. "Hartlepool were very well organised, defended extremely well and it's a long 95 minutes to hold your half and defend as they did. It takes a lot of stamina and focus and they did a great job. "We certainly played considered football, and in many ways it was a lot prettier than last week's 4-0 win. "The ball was on the floor a lot more today and there was a lot more passing, last week was a counter-attacking performance and a defensive performance."